Congratulations to the Good Diabetes Care in School Award holders in Wales, Diabetes UK officially recognises that these schools deliver effective diabetes care and management. View the winning schools below, and to view the national winners go to ourhonour wall. My daughter has received excellent care. She has been included in all school and extracurricular activities such as choir, netball, rounders, cross country and school trips. 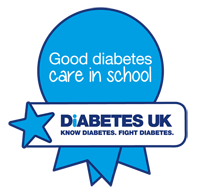 The school is well organised with regard to support and care for children with diabetes at the school. The school has been so supportive from when my son was diagnosed at the age of 4. The staff have always worked closely with me in dealing with my son's Type 1 diabetes, we have a very good relationship and they are all very caring and understanding. He has been on day trips and residential trips with school and I can't thank the staff enough for the way they have cared for my son throughout his time at Llanilar school. I have been able to take my child to school, knowing that he is cared for and that if the staff have had any concerns they will phone me to ask for advice. They have done everything that any parent of a child with Type 1 diabetes could ask for, and believe me, that goes a long way. The school offer individualised care for the child in partnership with parents and the healthcare team. The school have done a marvellous job in caring for the child and allowed them to have a normal schooling experience. The school work really hard to make sure my daughter is safe in school and she is not treated any differently to the other children. She is only 5 years old, so is reliant on teachers while she is in school to control her diabetes. They have also done a lot of work with ‘carb counting’ to make sure she doesn’t miss out on anything. They make sure there is always 2 staff in school to look after her diabetes needs. They also plan everything ahead so if there is a change in routine or trip, we work together to make sure her diabetes needs are always met, and they have a plan. The school have worked tirelessly to ensure the child can go to school safety and enjoy school. They have embraced training and now manage CSII Therapy well. They have done marvellous work in the way they look at the child's diet and carbohydrate counting. The school deserve this as they really work hard to allow her to lead a normal time in school in a safe manner. A great team effort. If any problems arise in school I am informed and feel that not much more could be done to put my mind at rest over my daughter's care while in school. The care she gets from this school is fantastic! The nurse supervises diabetes care within the school. She keeps in contact with us, notifying us of any problems or issues with pupils with diabetes. Also highlights any training issues at school for us. The school enables parents of children with diabetes to know their child is looked after, that there are no concerns over their care. They are also now aware and can look out for signs of any other children who may show symptoms. Gone out of their way to meet the child's emotional needs post diagnosis.